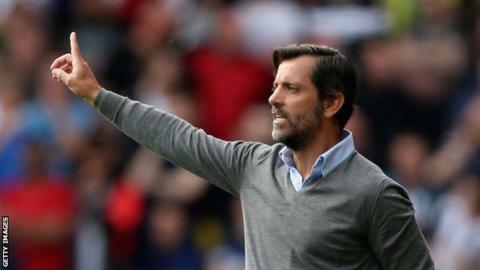 Watford manager Quique Sanchez Flores says he may look to bring another central midfielder to Vicarage Road. The Hornets have brought in 12 players this summer, but Spaniard Flores remains keen to add to his squad. "We are a bit weak in central midfield," he told BBC Three Counties Radio. "The season is very long and maybe we'll need to rest players. "Maybe we will have news in a few days. There might be one more player to come in this position." Earlier this week the Hornets signed 32-year-old former Italy midfielder Alessandro Diamanti on a season-long loan and Flores emphasised the need for players of his experience. "Diamanti is very important for us because we need experienced players who know this kind of level," he said. "Diamanti is this kind of player; he has skill, technique and we are very happy to have him in the squad." After opening the season with draws against Everton and West Brom, Watford face Ronald Koeman's Southampton on Sunday. "West Brom were strong at set-pieces but against Southampton maybe we will try different things," Flores said. "Southampton have a style and I think they'll keep it against us. "Every match is a new opportunity to show we are a competitive team. This is the mentality I try to transmit to the players."